Agent comes with a lot of motion detection options. You can also add more by using the plugins option. 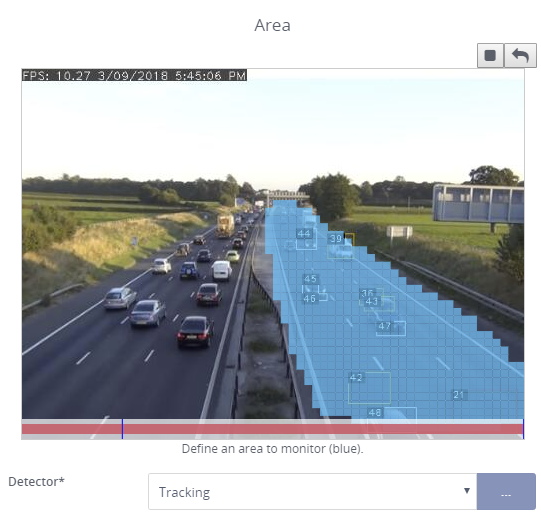 Use the area control on the motion detection tab to define an area to monitor. Use the controls at the top right of the area to change the drawing pen size or to reset the area. Use the left mouse button to draw and the right mouse button to erase. Select a motion detector. Then click to configure it. The motion detectors are explained further below. Overlay displays an overlay from the motion detector on the video. This is useful for detectors like object recognition and trip wire counters. Color specifies the color of the motion detector overlay. Sensitivity sets the trigger points (low and high) for triggering motion detection events. You may want to ignore 100% motion events as this may indicate PTZ movement or sudden flashes of light. Gain is a multiplier that makes the motion detection more or less sensitive. Gain only applies to the simple detector as other detectors are looking for specific events like object recognition or objects crossing trip wires. The first step is to configure the main Detector. Usually the default values here should be fine but you may need to adjust them based on lighting and framerate. You should be aiming for a completely black screen with only moving objects showing up as white. Frame Size controls the size of the frame that is sent to the motion detector. 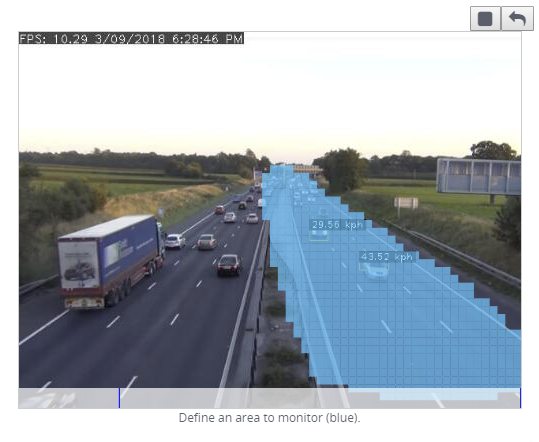 Motion detection can use a lot of CPU so Agent resizes the live video before passing it to motion detection for processing. If you are running low on CPU then choose small here. Small should generally be fine for most purposes but if you want fine grained motion detection choose a larger frame size. Threshold controls the amount a pixel must change by to signal movement. For high noise environments this should be set to a high value. 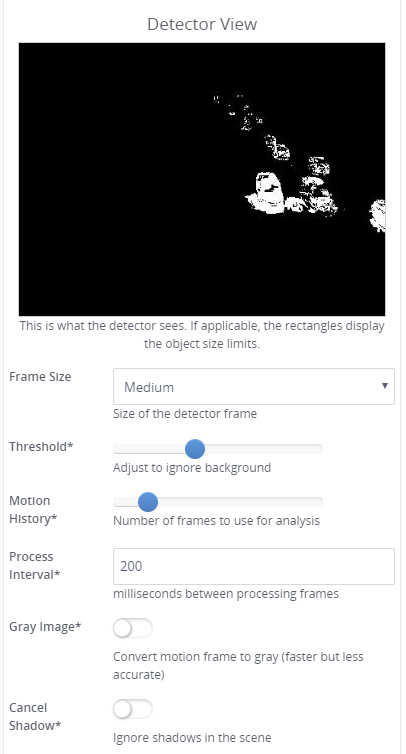 Motion History - agent uses previous frames to learn what is real movement and what is repetitive noise (like moving bushes in the wind or rain) - adjust this to control the number of frames Agent should use to learn. Process Interval is the minimum time in milliseconds between processing motion frames. The default is 200 which is 5 frames per second. Decrease this value to process more often. For example 50 would be 20 fps. Gray Image Agent can process both color and gray images for motion. Gray frames use less CPU and are preferable in most cases. If you need finer detection control then switch to color. Cancel Shadow. The motion detector includes a function to detect and ignore shadows in scenes. You can turn this on or off here. Turn it off if Agent is missing events. The simple detector just looks for any movement. This also uses the least CPU. 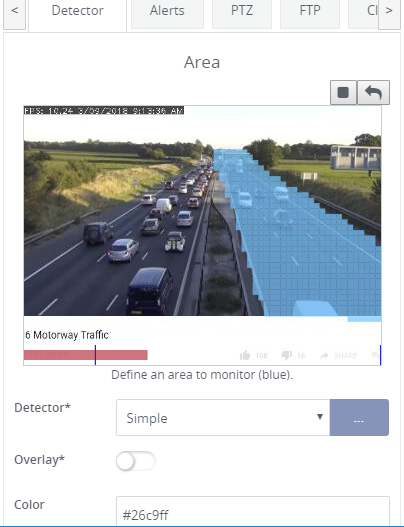 Control the level of motion that triggers movement detection on the main Detector tab. This and some other detectors use a size range setting to look for moving objects in a specific size range. Use the Width and the Height limits on the Detector tab to set the range. 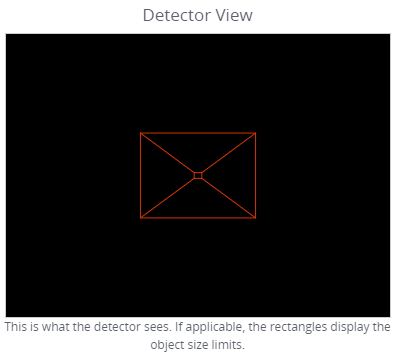 The range that Agent will look for is between the small and the large rectangles on the Detector View. Minimum Travel is the distance a detected object must move before it becomes "active" - inactive objects are ignored. Minimum Time is the minimum time a detected object must be observed for before it becomes "active" - inactive objects are ignored. 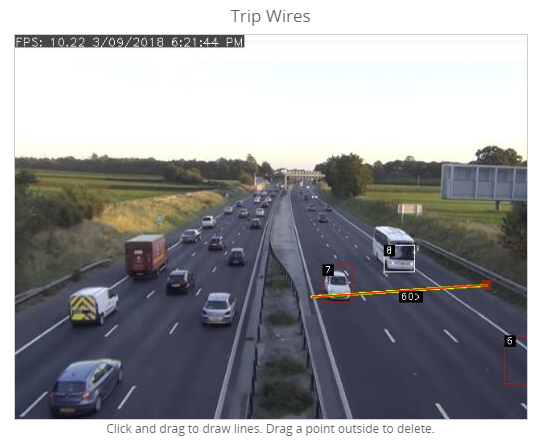 Use trip wires to detect when objects cross a line in the camera view. You can add as many trip wires as you like. To draw a trip wire click and drag. To remove a trip wire just drag one end of the line outside of the viewer and release. Alert - generate motion detection events - this can be useful to monitor doorways and only alert when someone leaves for example. Horizontal Distance and Vertical Distance - Set the visible horizontal and vertical distance so agent can calculate speeds properly. This uses a custom algorithm to look for pedestrians. This uses files called haar cascades to recognise objects in the video. Some ONVIF devices have their own motion detection features built in. Selecting this mode along with an ONVIF capable camera will make Agent listen to the device itself for motion detection events and trigger based on those.